Men who are on a tight budget may appreciate a super-cheap body trimmer. 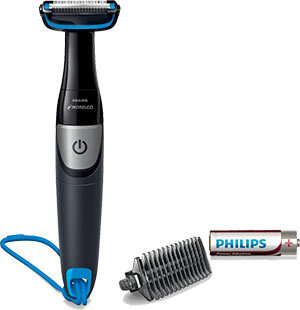 The Philips Norelco Bodygroom 1100 Body Trimmer BG1025/60 is under $20. It has a slender long black body with silver power on/off button. It also has some other useful features that men will like for their full body grooming. It has two rows of metal comb-like trimming teeth installed in the head which are encircled by a blue strip. 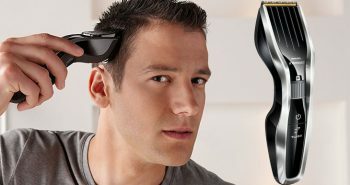 This is a bi-directional trimmer to seamlessly cut hair in either direction. On either side is a row of black grooves to guide the hairs to the cutting blades. These grooves are part of the integrated skin protector guards that will protect your skin during trimming so you don’t get any nicks or cuts. Your skin will be guarded as you trim. You can also use it in either direction, as it will trim hair down to a 1/64th of an inch. 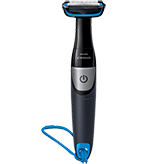 This is the perfect trimmer to tackle sensitive skin. Being able to use the trimmer in both directions also means that you’ll more effectively be able to trim hairs that are growing in either direction. 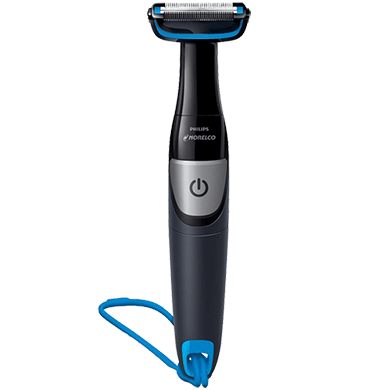 The Philips Norelco Bodygroom 1100 trimmer is a lot like a safety blade, but you won’t have to replace the blades in this trimmer. This makes shaving and trimming the body a more affordable solution. These are permanent blades. You also won’t have to worry about long electrical cords getting tangled up in the bathroom or around you as it runs on a battery. It also has a long blue loop at the bottom, so it can be hung up in the shower or bath. This body trimmer runs on one battery so it can be used wet or dry. Men have the choice but it’s recommended that it will work at optimal performance on dry hair. There is also a grey trimming comb included. This can trim hair down to 3 millimetres. Men can trim head, face, arms, chest, and more. The trimmer can trim from either side which makes for easier trimming. 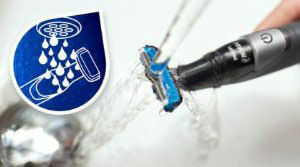 The Philips Norelco Bodygroom Series 1100 Body Trimmer BG1026/60 can also be easily cleaned by rinsing it under the tap. This groomer is maintenance free and doesn’t need motor oil. It takes only one AA battery. 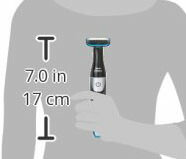 The Philips Norelco Bodygroom 1100 Body Trimmer BG1026/60 is also easy to take anywhere with you. You can tuck it into your bag for trips, or just bring it with you for a touchup after work. 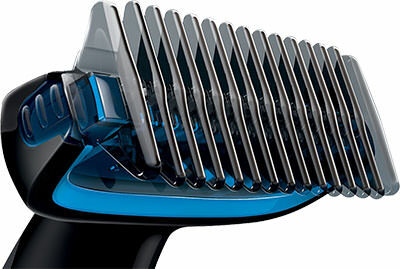 The Philips Norelco Bodygroom 1100 measures seven inches in height, or 17 centimetres in height. 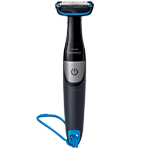 It’s smaller and more compact than other types of body trimmers, but some men may prefer that for travelling overseas. It also has a reasonable sound level. If you keep the door closed you won’t wake a sleeping partner while you use it. In the box you get one Philips Norelco Bodygroom Series 1100 Body Trimmer BG1026/60, a 1/8” trim comb, a AA battery, and a waterproof shower cord. The battery should last you for an average of two months before you need to replace it. The package measures 1.6” x 3.9” x 7.9 inches and weighs 5.8 ounces. Philips actually has three different Bodygroomers, which can make your final choice a bit difficult. There is also the Bodygroom 3100, and the Bodygroom 7100. These two options do have more trimming options and extra combs but they do cost more money. They are also rechargeable. All three are water resistant. If you want an affordable body trimmer without a lot of features, then you can buy the Bodygroom 1100. But if you want a rechargeable option, take a look at the other two offerings. 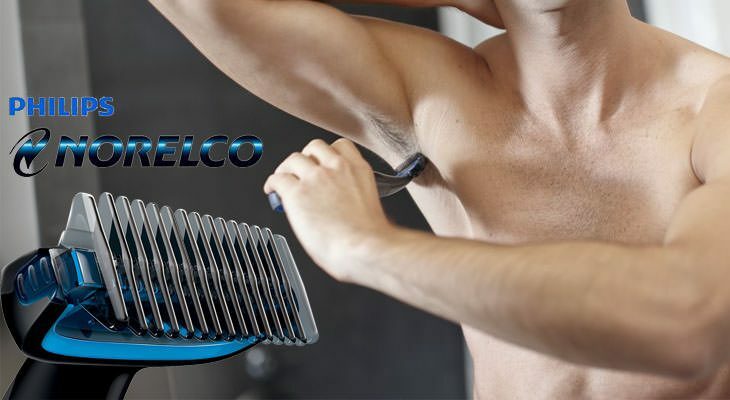 If you need a solution to trimming hair below the neck, the Philips Norelco Bodygroom 1100 Body Trimmer BG1026/60 has an integrated skin protector guard that will protect your skin as you trim. You also get one trimming comb so you don’t have to have to shave all your hair off. 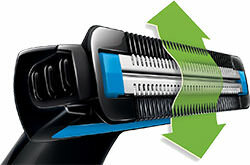 You’re also backed up by the Philips brand so your trimmer will last a long time.